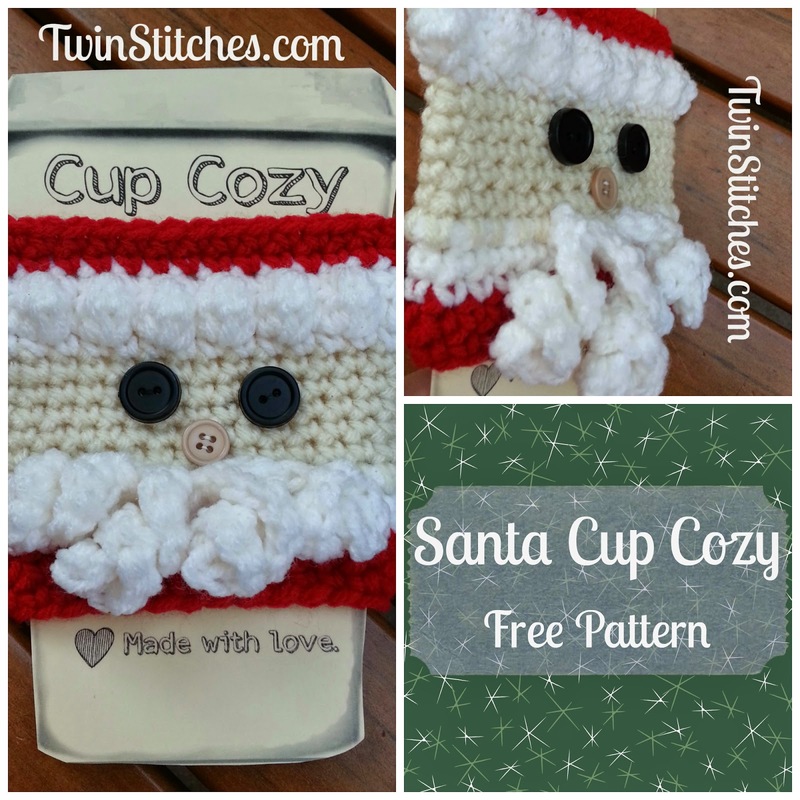 Tw-In Stitches: Santa Cup Cozy - Free Pattern! Hi, Tamera! I think it depends on where you live. What country are you in? Could you please add this to your ravelry page so I can save it there? Cheers! Thanks so much for sharing your pattern with us. I'm going to make this for myself soon..lol. In row 4, you should have crocheted a single crochet in each of the stitches where you created the slip stitch and chains for each part of the mustache. From Row 4: "Single crochet in each of the next 12 stitches. *Slip stitch into the next stitch and chain 10. Working back along the chain, crochet 2 single crochets in each chain back to the initial slip stitch. Single crochet into the same stitch as the slip stitch. * Repeat from * to * three more times. " Your single crochets in row 5 go in the top of each of the single crochets around in row 4. The mustache/beard spirals should be facing out on the right side of the crochet. Hi Jennifer! I'm kind of a self taught crocheter, thanks to you and a few others for sharing. I made the owl cozy and it's adorable but my daughter in law saidit stretched out a little. Any hints for fixing this or for preventing it in the future? I really a visual learner. Do you have videos also? 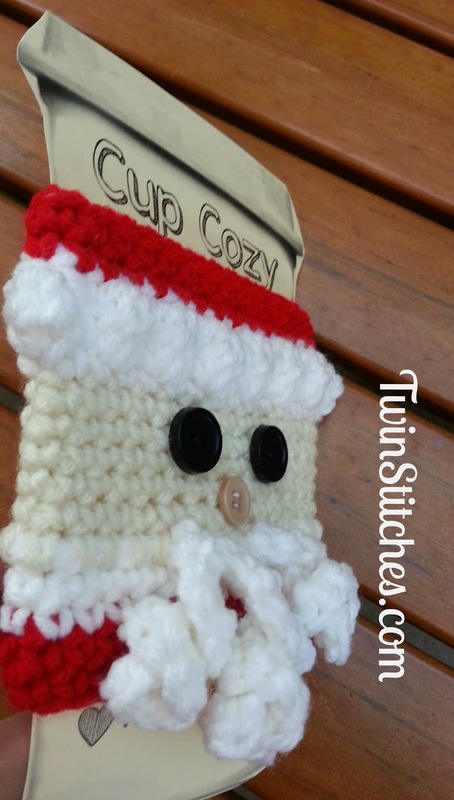 I don't have an owl cozy, but if you make the Santa one, you can run a row of slip stitches in the last row. That will keep the top from stretching. The bottom already has a row of slip stitches, so it should stay okay. 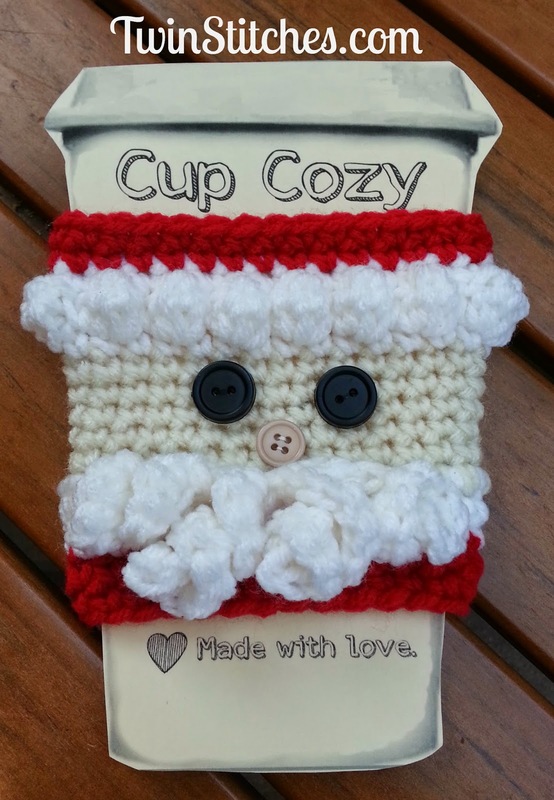 On my cup cozies I finish the top with a reverse single crochet (crab stitch.) It is a nice finished look and doesn't stretch. Takes a little practice, but it's not too difficult. At the beginning of each row are you SC in the same Stitch as the chain 1 or are you sc into the next Stitch? Also how many stitches areally you to end up with at the end of each row? This would be helpful in the patter cause it can affects how the outcome is. Always SC into the same stitch as the chain 1. You should have 28 stitches around.